HOLY COW.......wow you are good. I need to stand on the roof and sing your praises. You have a level customer service you just don’t find any more. Dude I am impressed. Thank you, Josanna D.
Phil, You resurrected my knives from the dead! Thank you!! I bought my Henkel chef knife 20 years ago when I was stationed in Germany. Aside from honing the edge once in a while, it’s never been sharpened. I think it’s even sharper than when I bought it! The santoku knife is also back to life and better than new! I will definitely recommend you to anyone and send my knives to you again … if they ever need sharpening again (which I doubt because you did an outstanding job). I have a carving knife and a couple steak knives that’ll need some attention soon. I know where I’ll go for that. Thanks again! Kevin W.
I received a set of Henckel knives as a wedding gift from my best man. For nearly twenty years I used them almost daily, to the point where I couldn't even cut bread. I therefore delved into the great Internet expanse and found www.thesharpknife.com. The service appeared in writing very professional, the cost reasonable and the promised turn around superb - so I took the plunge and I'm glad I did. I mailed my knives off on a Wednesday, and they were received on a Friday. I immediately received an email confirming receipt of my knives and offering me the option to pay via credit card. The very next day (a Saturday mind you!) I received an email that not only were my knives complete, but that the job cost less than had been approximated; and furthermore, that they had already been shipped back to me! Two days later I was back to use my wonderfully sharp knives on Monday evening's family dinner. Thanks www.thesharpknife.com. Thumbs way up. Martin Q.
Hi Philip: The knives arrived today. My wife couldn't be happier. She's in the kitchen now, cutting anything she can find just because the knives are so easy to use. Thanks for doing such a great job! Mike A. Hey Philip, Received my Knives today.. WOW! Awesome Job.. Thank You.. You are from here forward my knife sharpen source and anyone I can turn on to you.. Thank You Brother.. Greg M.
Thank you. Looks and feels good. Will send more later in the fall. Virginia G.
Thanks so much, Philip...we chefs can't be away from our knives for long. Really appreciate your quick turn-over! Kathi B. You just made my day. You make this so easy :-) Theresa B.
thank you Philip, I'm so thrilled, I love sharp knives! Meghan W.
Hi Philip, I received the knives in the mail today, thank you for the quick turnaround time. You did a wonderful job putting the edge back on and they’re a pleasure to use now that I have sharp knives again; much appreciated. Tony D.
Hey Philip, The chipped Henckels Santoku I sent you the other week is better than when it was new. We thought it was ready for the trash; our Wusthof sharpener did nothing to help it. After seeing the work you did, I am reluctant to use that hand held sharpener again. Thanks for your expert work. We will continue to send our knives to you. So pleased! Tom D.
Dear Philip, Thank you for the quick service over the holidays. Shirley H.
You guys do a great job. More headed your way. Keith H.
Hi Philip The knives came today. Thanks very much for the great job and quick turnaround. Some time ago I purchased a Chefs Choice 315S electric sharpener for asian knives, but have not used it. I think I'm afraid to take a chance and ruin my knives. Might get the courage to try. Thanks for the advice on how to care for my knives. Will certainly keep you at the top of the list for future needs. steve b. The knife arrived & is great - thanks for your excellent work! Sally A. Thank you for excellent service. We received our knives and scissors today. They are razor sharp as promised. We'll certainly be sending you more work to do. JoAnn F.
Thank you for your quick response. Mike M.
Dear Phillip, I’m writing to express my delight at the job you did with my knives (just received yesterday). You can count on my repeat business and I will be recommending your service. Mark K.
Thank you for your prompt service. Dianne A.
thanks good follow up on the order Marty C.
We love our knives, appreciate your service, and you will hear from us again in about a year. Teri W.
Thanks Phillip. You do awesome work. The last knife was just like new! Robert R.
Thanks a ton. Will have them back to you in 12 months or so! Kenny K.
Phillip, I got my knives today and I could not be happier. They are awesome! Thank you so very much. If I can recommend you somehow, please let me know. Chris H.
Wow, thank you Philip! I appreciate the sharpening. My brother Rich was very happy with his and referred your services. Thanks again! Sam H.
Hi Philip, I've been away from home since you sent my knives back. Just wanted to thank you for the great job. It's like having a new set of knives. Thanks so much, Bill C.
Hello Philip, I just returned home after vacation and found my knives. Thanks for a great job, they are perfect. I learned a lesson! Have a great new year, Olivier P. Philip...I am so glad people like you are around...Thanks for the hard work, can't wait to use them. I will get the ceramic hone, been using a steel for 35 years...it that 35 years I met only one chef that knew how to sharpen knives .... he moved away. Thanks again..... Jerry W.
Dear Phillip, Just wanted to drop you line to tell you that your blade renewal on my wusthoff and heinkel knives is really great. Thanks for the expert job !!! William B.
Hello Philip, Just wanted to say the knives arrived home safely. And Oh Luxury!!!!!!! What a pleasure to use. Thank you, thank you! Joanne S.
Hi Philip, Thank you so much, we truly appreciate your quick response! Have a happy Thanksgiving, Mark & Lisa G.
Thank you! I have received them...and they look great! Thank you for the quick turn around and for nice sharp knives again! Trudy O.
Hi Phillip: Our home computer has been in for service, so I wanted to respond to your email for Susan. We received the knives and they are like new, maybe better! Thank you very much for the new blades. We will pass on the word of your service. It was great, especially all of the communication. Regards, Andrew G.
Philip, Thank you for the super fast response. It is nice to know that there is someone that still knows how to sharpen knifes as it seems to be a lost trade. Thanks again, Dwight R.
Philip, Thanks again for the prompt turnaround. I am a bit of a fanatic when it comes to sharp knives and I know I drive my family crazy insisting that every knife be as sharp as possible at all times. while knife sharpening is certainly not my hobby, it could be characterized as an obsession of mine. The serrated bread knife came back today, and I must say I was impressed. it was put to use at dinner tonight and I must say, it has never cut a slice of bread as well or easily short of the day I bought it. Serrated knives are a bit more challenging to keep sharp, hence my search for your service. Thank you again for the great work, I appreciate your passion for all things sharp...Best Regards, Tom G.
I received my newly sharpened knives today. Wow! They are like new again. The high carbon stainless blades are great again, but the Sabatier carbon steel blades are like razors! I will keep up with edges with my honing stone and will definitely be sending back wo you when they need sharpening again. Thanks again do much! Andrew K.
Thanks, Philip! The knives arrived Friday and they are fantastic! We'll be telling everybody about you. Paul is REALLY picky about his knives, and you surprised him. Expect return business and referrals! Becky J. Thanks for the quick turnaround !!! Wendy M.
Hi Philip, Thanks so much for your quick work and information. Kenny K.
Hello Thank you for the quick work! Liam D.
Hi Philip, I wanted you to know that I used my knives for the first time since you sharpened them and... WOW! My Henckels haven't cut like this in years. What a huge difference. 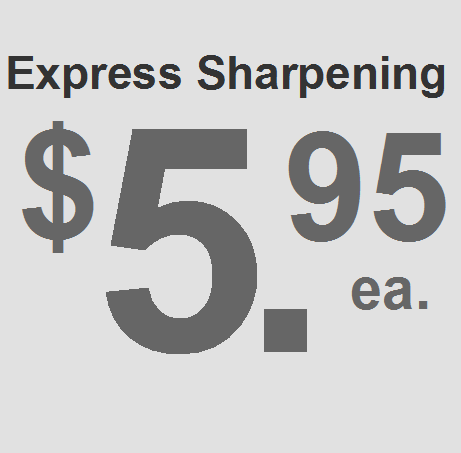 I'm going to post about it on my Facebook tonight so my friends will know where to get their knives sharpened. Thanks so much! Have a great night, Jasmine C.